Introducing our new range of patties packed with flavours from around the world. It’s hard to fault a pie, particularly one of ours. But let’s face it, eating them with your hands can get messy, particularly when you’re on the move. So we decided it was time to create a pocket-sized snack, for when you just want to grab something delicious by the crust and go. 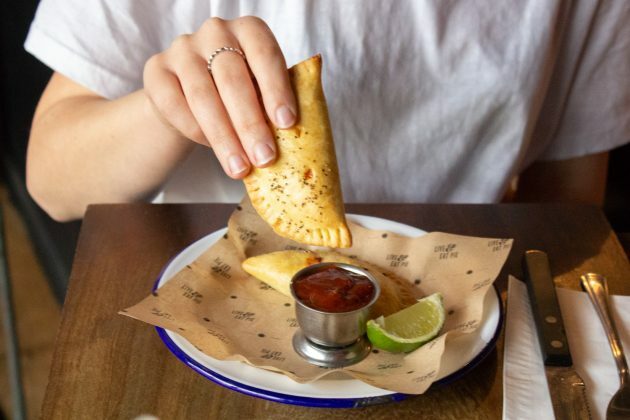 After playing around with our classic pie lids, creating all manner of turnover-type pastries, we finally landed on the perfect creation: a portable patty that fits into the palm of your hand, to be devoured in about four satisfying bites. They’re delicious hot or cold – so perfect for picnics, lunch-hours, rambles and road-trips. Come and get them from our cafes and restaurants. They’re £2 each, to enjoy hot or cold, in or out. Or pick your favourite three for a fiver with some spicy (vegan) ketchup on the side. Look out for them in good delis and our pie pubs too. There are four to choose from, each filled with great tasting, great quality ingredients encased in a golden saffron pastry. The two vegan patties, both registered with the Vegan Society and carrying their trusted Vegan trademark are Vegetarian Society Approved too. The third patty is made with free range British chicken and the fourth, free range British pork. And you can buy all four nationwide through Ocado from mid-June. Available in packs of two (£2.50) the packaging is plastic free and fully recyclable, made with recycled card and a transparent outer made from wood pulp. Make sure you order some fast: for the first four weeks of the launch in Ocado, if you buy two Pieminister pies, you’ll get a pack of patties free! They’re the life & soul of the patty!